IRIN interviewed Djibouti’s President Ismail Omar Guelleh on 27 January in Arta about the drought, humanitarian challenges and regional issues. Q: Is the current drought in Djibouti more serious than previous ones? A: We are going through what meteorologists call the La Niña phenomenon. The problem in our region is that we don’t plan properly for what we know is coming. Four months ago, we had a lot of rain. Four months later, we are dying of starvation and lack of water. In Djibouti, we are continuously monitoring the drought situation. There are some parts, particularly the eastern part of the country, that are more seriously affected than other parts. We have sent teams there to make sure that people [in need] are reached before it is too late. Government ministries are working with [the UN] WFP [World Food Programme] to mitigate the situation. There is no catastrophe; we are managing the situation. Q: These droughts recur yet the Horn of Africa does not seem to learn from the past. In your opinion, can droughts be tackled in a sustainable long-term manner? A: A lot of things can be done. First, it is a matter of planning and harvesting rain water. We also need to control livestock grazing so it does not deplete the grazing areas. Some areas should be off-limits during good rains, so they become available during dry times. We also have drought resistant plants that grow in this country and the region. In Djibouti, one of the things we want to do is to make those plants become animal feed so we can make it available in drought times when pasture is low or non-existent. We have carried out studies on water-harvesting; we intend to create reservoirs that can hold 10-20 million cubic metres of water. Once we do this, the water will become available during the dry seasons. Q: What would you say are the other main humanitarian challenges facing Djibouti? A: First and foremost, we must defeat this drought and famine problem; and we can do it. This is our main challenge. 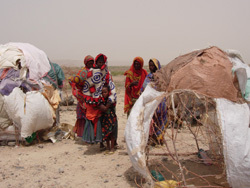 [Djibouti] An Afar community living in drought-stricken Buia region, near the Ethiopian border. Q: The country is currently experiencing an economic boom, particularly in construction. How well is the economy doing and how has this benefited the population? A: Our growth is good, at 5.5 percent and our deficit is low. We are also attracting a lot of direct foreign investment. The economy is creating jobs but, unfortunately, we lack the skilled workforce that can take advantage of it. A lot of jobs opening up require specialized skills and our youth do not have these yet… We do have unemployment, but we are addressing that to make sure that our people have the skills they need to get jobs. Q: Three years ago, Djibouti's Global Acute Malnutrition (GAM) was 17 percent - higher than the World Health Organization threshold of 15 percent. Has this situation changed? A: We initiated a lot of health centres with our partners throughout the country to monitor malnourished children and provide the necessary food to those identified. Mothers come to centres to feed the children and take them back home in the evening. We are seriously tackling this problem and we intend not only to reduce it but eliminate it before 2015. The government also will achieve its MDGs [Millennium Development Goals] in education, particularly girls’ education. Q: What is Djibouti's border situation with Eritrea? A: We have Qatar mediating between us. Our lawyers have presented all of our documents stating our case. We are hopeful the situation will be resolved very soon. Q: Somalia has been a key challenge for the region and for Djibouti in particular. Do you sometimes despair about the situation? A: I do sometimes despair. We have invested a lot of time and resources to try and get [Somalia] out of the situation it is in. At the moment, I cannot honestly point to anything that I can say `If this is done, Somalia will regain its honor, dignity in the world.’ I just don’t know what the cure is. We are in a situation where, when someone becomes president, some group will say he is not to our liking and they [usually] have veto power. The only reason they don’t [like] that individual is because they don’t [see] their own personal interest in there. It has nothing to do with the interest of the people or what the people want. Q: There has been talk of Djibouti sending troops to Somalia; are you sending peacekeepers, and what difference would that make? A: We are not sending combat troops but trainers. We want to train our Somali brothers and instill in them that they are the owners of their country; they are the ones who must die for it. They must be able to challenge every other armed force. Our aim is to build the capacity and foundation of the Somali army. Q: In your opinion, what more can the UN/international community do to help Somalia? A: We are at a stage where people have scissors to cut up the country. The other day I heard about a southeast state. The US mentioned that it talks to existing entities; now everyone is getting in on the act. Intervention from outside has not helped and will never help. The solution is for the people to say stop. I would like to see the people of Somalia say they have had enough of displacement; they have had enough of being refugees and that they have had enough of guns.